Unpack; plug it in, start heating. You will be impressed with the P4 Pellet as soon as it is installed in your boiler room. Working on the “plug and play” principle, all components are pre-wired. The components can also be installed separately, and little space is required. This means that you can start heating shortly after the boiler has been installed. The safety valve and the speed-regulated induced draught fan make the boiler particularly easy and safe to use. The patented multiple-pass heat exchanger means that operation is perfectly adjusted in every respect with the P4 Pellet. No return mixer device is required, saving on installation and operating costs. The patented 3-pass design means long combustion, guaranteeing very low emissions. 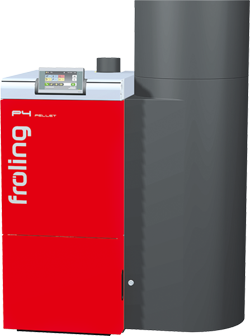 The P4 Pellet boiler is amazingly easy to use. Fuel transport, ignition, combustion control and cleaning are carried out fully automatically. Another impressive feature is the almost inaudible operation.